A Labour back bench MP is bringing a new 'assisted dying' bill before the House of Commons. 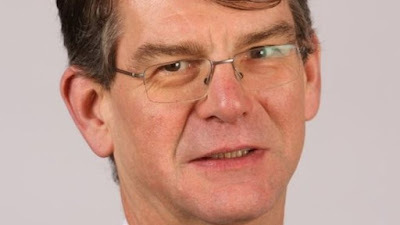 Wolverhampton South West’s Rob Marris (pictured) drew first place in the private members’ ballot last month and says he will pursue a bill broadly in line with Lord Falconer's proposals. Lord Falconer’s Assisted Dying Bill, which made provision for mentally competent adults with six months or less to live to be prescribed lethal drugs, ran out of parliamentary time before the election on 5 May. Falconer subsequently sought to introduce it in the new parliament but drew only 21st place in the Lords ballot, leading to the bill’s supporters to approach Marris. The move comes after MSPs voted 82-36 against Patrick Harvie’s Assisted Suicide (Scotland) Bill in the Scottish Parliament on 27 May. Marris’s Assisted Dying (No. 2) Bill received its first reading in the House of Commons this week, and debate on the principle of the Bill (second reading) takes place on 11 September. It is usual to publish a parliamentary bill on or soon after the first reading but Marris has curiously chosen not to do this. Some have speculated that this is a tactic aimed at keeping those opposed to the bill guessing as to its contents in order to give less time to mount specific criticisms ahead of the second reading debate. So the crucial elements are the same as Falconer’s Bill: mental competency, terminal illness, medical supervision and self-administration. But there is little detail on the proposed mechanism. However, Dignity in Dying (DID - formerly the Voluntary Euthanasia Society) have published on their website this weekend, a specimen letter for supporters to send to their MPs which gives much more detail as to the bill’s provisions. In other words Marris’s bill is almost identical to Falconer’s new bill. And as DID have actually drafted Marris’s bill and are pulling all the strings (Marris is merely the marionette), we can be fairly confident that this is an accurate description. 2. If we don’t legalise it in the UK people will go abroad to Dignitas, try to kill themselves here in an amateurish way, or turn to backstreet euthanasiasts. I’ll come back to these arguments in a later post. I believe they are all relatively easily refuted. Mumsnet is one of the UK's largest websites for parents, offering brands the chance to influence women via high-profile sponsored discussions and other forms of interaction. Mumsnet is currently raising money for charity. In its second annual Giving Week in partnership with JustGiving, it is ‘shining a light on five brilliant causes close to Mumsnetters' hearts’. 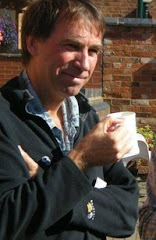 It promises to ‘matchfund’ any donations up to a total of £25,000. 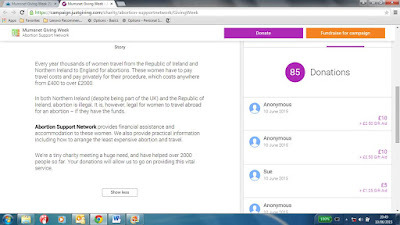 One of these five charities is the Abortion Support Network(ASN) which the Mumsnet website describes as a ‘tiny charity helping women in Ireland, Northern Ireland and the Isle of Man access safe abortions’. Mumsnet goes on to say that ASN aims to provide ‘practical information on arranging the least expensive abortion and travel, give grants to cover the £400-£2000 it costs to travel to England and pay for a termination, and provide accommodation in volunteer homes’. 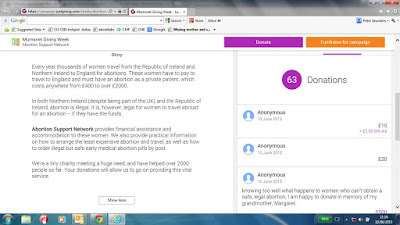 What they don’t say on their website– but which is revealed on their justgiving page – is that ASN also provides information about ‘how to order illegal but safe early abortion pills by post’ (see justgiving page below - click to enlarge - and enlargement above). Well at least it said that this morning when I looked (when there were 63 donations on the site). By this evening (85 donations recorded) the words in question had been removed (see below - click to enlarge). I then looked to see if they were on the ASN site (they weren’t) . Now this raises some interesting questions. The original Mumsnet quote has all the appearances of being supplied by ASN. But clearly something happened today to make them decide to take it down. I wonder what that was. Contrary to popular opinion abortion is still a criminal offence in Britain. All the Abortion Act 1967 did was to make abortion ‘lawful’ under certain limited circumstances. Two doctors must certify in good faith on a statutory form that one of these circumstances applies in a given case. Any abortion which falls outside these parameters – such as the supply of abortion pills on the internet without two doctors’ signatures or an abortion not performed in licensed premises – is a criminal offence carrying a custodial sentence. So women who procure illegal abortions, and suppliers who provide them with the means to do so, are both committing a criminal act punishable by imprisonment. Now unlike the Abortion Act which does not apply in Northern Ireland, the Offences Against the Person Act applies in all parts of the United Kingdom. So Mumsnet has been raising money for, and promoting, a ‘charity’ which it clearly believes supplies information about how to obtain illegal abortions. Mumsnet is clearly aware of this as it has put the information on its own justgiving page. Now let me spell this out a bit more clearly. Abortions carried out outside the bounds of the Abortion Act are criminal acts according to the Offences against the Person Act (section 58 and 59) and for both the woman and the supplier carry a custodial sentence. If ASN is indeed giving advice about supplying illegal abortion drugs by post, as the Mumsnet just giving page reports, then the police must uphold the law by fully investigating and reporting their findings to the Crown Prosecution Service. By actively promoting and supporting this activity Mumsnet itself is also potentially colluding in criminal activity. This is a serious matter for the police, the charity commission and the crown prosecution service. 1. 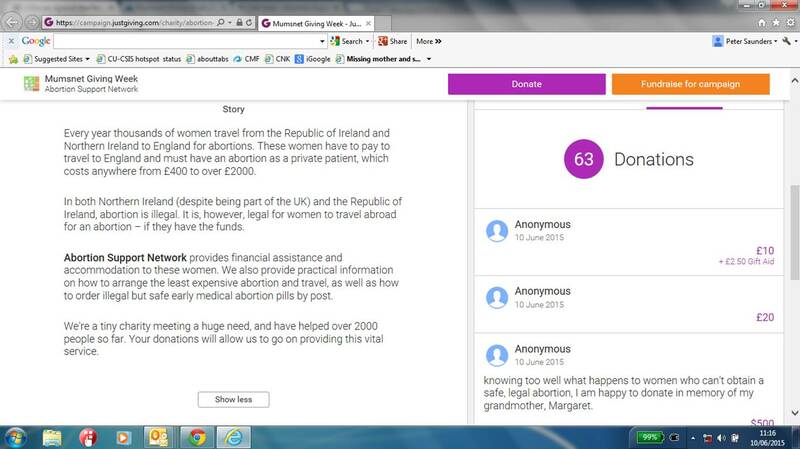 Does ASN (a registered charity) supply information on how to order illegal but safe early abortion pills by post? 2. If so were its sponsoring organisations BPAS, Marie Stopes and the Pregnancy Advisory Service aware of this and involved? If so how? 3. If not why did Mumsnet place this information about ASN on their justgiving page? Was Mumsnet misrepresenting ASN or just being careless in revealing facts which ASN (and possibly also BPAS and Marie Stopes) wished to keep secret?